In the first recorded discourse of this avatar, Manasa Bhajare, Baba says that the Lord looks not to the devotee but to his devotion, to his love; the Lord looks to the feeling behind the act. Baba is offering the stream of Mercy Divine: streams of love flowing between the Lord and the devotee, for Love is all there is in this world. All is manifestation and mirror of that which is within. If we wish to collect more bliss from the ocean of bliss, then we have to increase the size of the container, which means we have to cultivate expansive love. Expansive love is life; constricted love for I, Me, and Mine, is death. On previous occasions when God incarnated on earth, the bliss of recognising Him in the Incarnation was vouchsafed only after the physical embodiment had left the world, in spite of plenty of evidence of His grace. 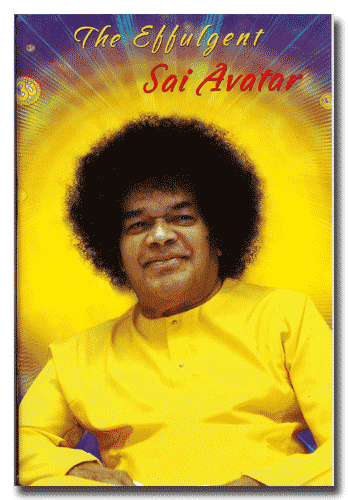 But ponder a moment on this Sathya Sai manifestation; in this age of rampant materialism, aggressive disbelief and irreverence, what is it that brings to it the adoration of millions from all over the world? You will be convinced that the basic reason for this is the supra-worldly Divinity in human form. In Come, Examine, Experience, Have Faith, Baba says “Your virtue, your self control, your detachment, your faith, your steadfastness are the signs by which people read of my glory. Baba has said that steadiness is the quality that he looks for in His devotees. Steadiness of purpose, steadiness of discipline and self control, steadiness of mind management, and steadiness of purpose. This is timely advice for this era, for learning is often measured as a function of memory and the ability to recall and relate facts in examinations. Examination results do not always indicate any ability to think; nor do they tell us if people have learned to live well. Has education truly reached its goal? Has it formed people with good character? We have to ask if education has taught students to single-handedly search for answers. Did they teach you how to freely seek the truth and live according to its guidance? Did they show students how to establish relationships with other people so you and they could find happiness? Did they teach you how to love Divinity and the whole of creation, how to find satisfaction of life? Did they show students that goodness that flows from man and enriches everything around, is? Did they instruct students how to keep themselves cool in everyday life situations? Did they show students that they could become an important member of society and bring true values into it? Did they show the way to turn to God, to receive His love, guidance and leadership? The end of education is character. Character is shown with unity of thought, word and deed. We elicit character from what a person thinks, says and does. So the ancient Indian gurukula system of education with preceptors and a small number of students with loving watching, listening emulating has a lot to offer education in this day and age. The Baba says, These days can be revived. When humanity allows the flowers of Sanathana Dharma to flourish, to welcome and sing the glory of God in all religions, be it Buddhism, Christianity, Zoroastrianism, Jainism or Islam; all paths are paths to the one True God. And when all nations welcome and have all these faiths practising in their lands with tolerance and mutual respect, then the Glory of Indian Education and Culture will be known all over the Earth. In Guidance to Youth, Baba makes observations on the fruits of education. “Among the educated, we find no sign of self-knowledge, nor do we see another vital quality that we expect every human being to have, namely, the quality of mercy, of sympathy, or compassion. The ‘uneducated’ have this quality more than the ‘educated’!” The end of education, Baba teaches us, is character. Good character is primarily passed on by good example and that example is principally unity of thought, word and deed. This is embodied integrity, where Truth, Right Conduct, Love, Peace and Non-violence are expressed in every human action. This is a most useful book for reading, reflection and action. It will repay reading, reflection and integration into action. Spirituality is not locking oneself away in a meditation room and thumbing the rosary beads whilst the mind is in the market-place, the work-place or last night’s episode on the television. Time waste is life waste, Baba teaches us. Spirituality is divinity-in-action, the expression of that flow of Mercy Divine in thought, word and deed in every relation we have with every other person.